Bam Margera cried so hard his body shook Tuesday night when he went to see where best friend and Jackass co-star Ryan Dunn died in a fiery crash. Margera rocked back in forth in agony at the guardrail that Dunn pierced with his Porsche Monday morning with such force that the car slammed through about 40 feet of trees before exploding into flames. Dunn. 34, and his passenger, Zachary Hartwell. 30, died of blunt and thermal trauma, according to the coroner. Margera and Dunn’s relationship dates back to high school – a bond so strong that Bam’s parents said Dunn was like a son to them. 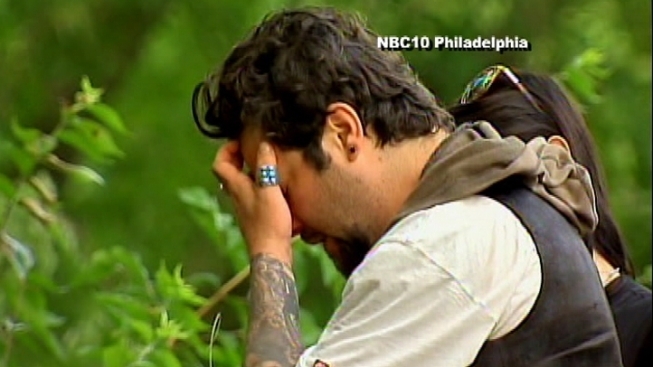 Margera came to the crash site with his wife, Missy, and a handful of friends. He seemed so distraught that at one point, Bam looked like he could have collapsed without his friends holding him up as he walked away. The crash on Route 322 happened less than 100 yards from Hartwell’s home in Chester County, Pa..